Instead of doing all the above by hand (using equations 3,4,5,6), it’s easier to construct the corresponding bayesian network and let some general algorithm do the work. Formulating the model this way makes it much easier to understand, in fact it seems almost trivial. Additionally, our assumptions of conditional independence (1 and 2) map directly into the bayesian network formalism of nodes and edges, quite convenient! 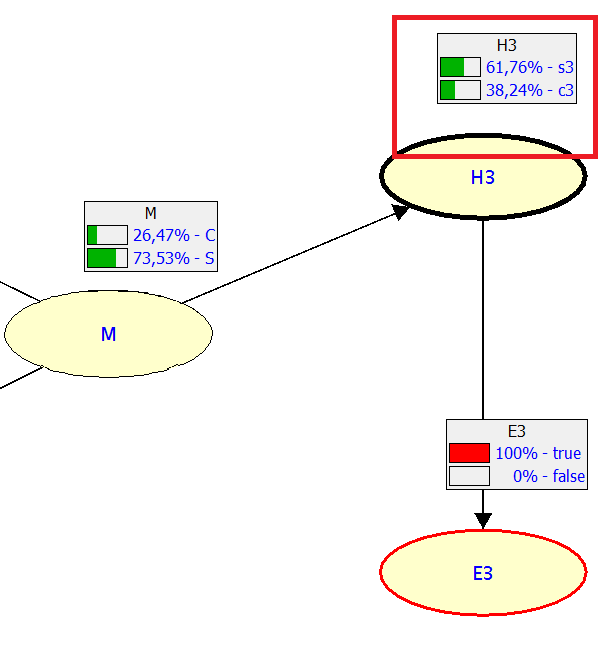 Node M represents the meta-theory, with possible values S and C, the H nodes represent theories, with possible values Sn and Cn. Note the lack of edges between Hn and Ex formalizing (1), and the lack of edges between M and En formalizing (2) (these were our assumptions of conditional independence). Occam seems like an unjustified and arbitrary principle, in effect, an unsupported bias. Surely, there should be some way to anchor this widely applicable principle on something other than arbitrary choice. We need a way to represent a meta-theory such that it favours some theories over others and such that it can be justified through observations. Now both S and S-until-T accrue the same probability through evidence and therefore produce the same prior on S3 and C3, 50%. It seems we can’t escape our original problem. 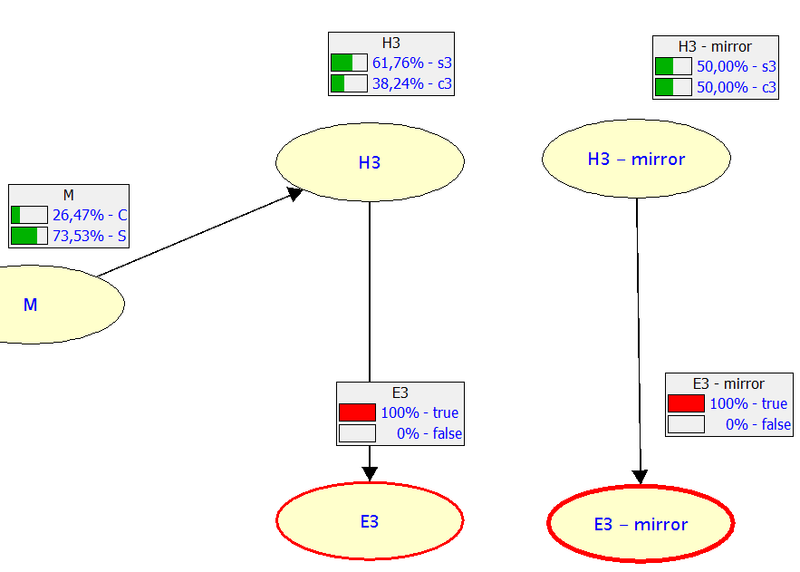 Because both Occam and Occam(t) are supported by the same amount of evidence, equal priors will be assigned to S3 and C3. The only way out of this is for Occam and Occam(t) to have different priors themselves. But this leaves us back where we started! We are just recasting the original problem at the meta level, we end up begging the question or in an infinite regress. In conclusion, we have succeeded in formalizing meta-theoretic induction in a bayesian setting, and have verified that it works as intended. However, it ultimately does not solve the problem of justificating simplicity. The simplicity principle remains a prior belief independent of experience. We want to formalize this statement into something that integrates into a bayesian scheme, such that the usual inference process, updating probabilities with evidence, works. The first element we want to introduce into our model is the notion of a meta-theory. A meta-theory is a statement about theories, just as a theory is a statement about observations (or the world if you prefer a realist language). ..because they have been so in the past. As pure priors, meta-theories would never be the object of justification. We need a way to represent a meta-theory such that it favours some theories over others and such that it can be justified through observations. In order to integrate with normal theories, meta-theories must accumulate probability via conditioning on observations, just as normal theories do. We cannot depend on or add spurious observations like “this theory was right” as a naive mechanism for updating; this would split the meta and theory level. Evidence like “this theory was right” must be embedded in existing observations, not duplicated somewhere else as a stand alone, ad-hoc ingredient. Finally, the notion of meta-theory introduces another concept, that of distinct theory domains. This concept is necessary because it is through cross-theory performance that a meta-theoretical principle can emerge. No generalization or principle would be even possible if there were no different theories to begin with. Because different theories may belong to different domains, meta-theoretic induction must account for logical dependencies pertaining to distinct domains; these theories make explicit predictions only about their domain. Our model will consist of observations/evidence, theories and meta-theories. 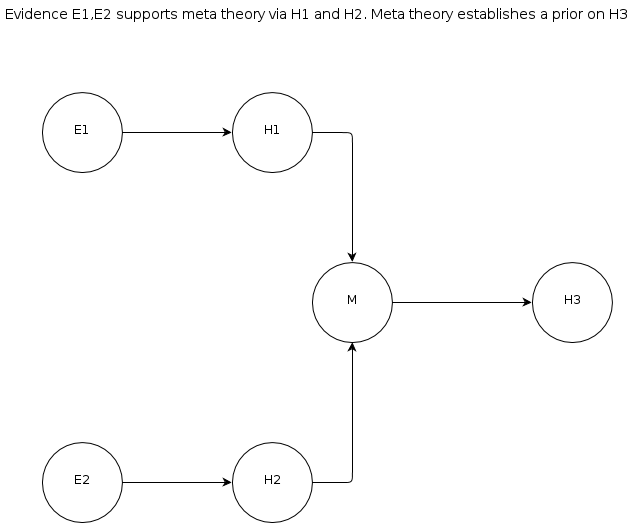 Theories and corresponding observations are divided into different domains; meta-theories are theories about theories, and capture inter-theoretic dependencies (see below). Meta-theories do not make explicit predictions. Observations that do not pertain to a theory’s domain will be called external evidence. An important assumption in this model is that theories are conditionally independent of external observations given a meta-theory. This means that a theory depends on external observations only through those observation’s effects on meta-theories. Additionally, any evidence is conditionally independent of a meta-theory given its corresponding theory, i.e. it is theories that make predictions, meta-theories only make predictions indirectly by supporting theories. 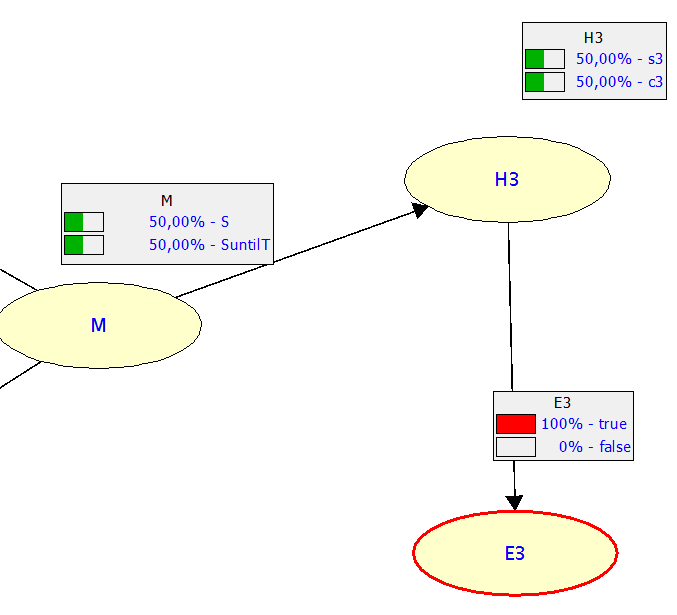 Equations 3,4,5 and 6 are the machinery of the model through which evidence can be processed in sequence. See it in action in the next post. A given En represents a sequence of observations made for a domain n. So Hn|En represents induction in a single step, although in practice it would occur with successive bayesian updates for each subelement of evidence. This characteristic is the meta analogue of conditional independence between observations given theories. In other words, just as logical dependencies between observations are mediated by theories, inter-domain logical dependencies between theories are mediated by meta-theories. Note that I have described Occam as a simplicity bias. I deliberately chose this word in order to convey that simplicity is a guideline that we use prior and independent of experience. In the language of probability, Occam takes the form of a prior probability distribution that favors simpler theories before any updating has occured, and is unaffected by posterior evidence. thus grounding the principle on experience, just like any other case of inductive inference and scientific knowledge. But let’s go back to the source of the problem that this principle is trying to fix. We have two theories, S and C, which make identical, correct predictions with respect to all observations made to date. These two theories only differ in their future predictions. Because simple theories have been true in the past. Whatever the mechanism by which the simplicity meta-theory accumulates posterior probability, so shall its peculiar brother, and in the same exact amount. When going back to our two theories, S and C, Occam will favour S while Occam(t) will favour C. Because both Occam and Occam(t) are supported by the same amount of evidence, equal priors will be assigned to S and C. The only way out of this is for Occam and Occam(t) to have different priors themselves. But this leaves us back where we started! The way I see it, the foundations of scientific knowledge are the postulates of probability theory (as derived for example by Bernardo-Smith or Cox) together with Occam’s razor. In essence, this is the problem of induction, which dates back to Hume who first posed it in its original form.